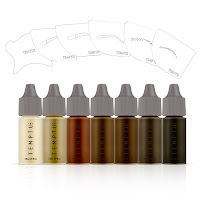 Temptu has been at the forefront of airbrush makeup innovation for many years, and you only need to look at our reviews of their products to know how much we love this brand. Having said that, we weren't prepared for the amount of improvements and advances that came from this company in the last year alone. During our recent trip to Los Angeles we were lucky enough to be able to meet with the lovely and talented Jackie Fan, Temtptu's manager of Global Education and Artistry, right before her move to the East Coast where she will continue her work with this brand after the consolidation of the LA branch in to the New York operation. Jackie was kind enough to take us through the many new products that are coming out this year. Some of these are already huge hits in the industry, like the portable device Temptu Air. Others were literally just being launched at the impending show, like the AirPod Pro, the new Root colors and the Hydra Lock foundation. We managed to sneak a peak of most of these, and others were described by Jackie in our extensive interview that we will publish very soon as part of our Airbrush Makeup Gurus series. 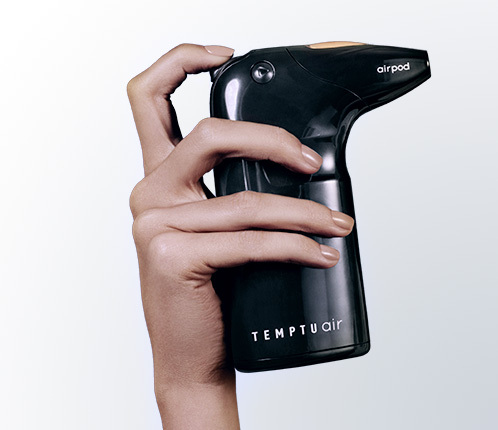 Temptu Air is a portable, standalone rechargeable device that was created to work with Temtpu's AirPods. As we live in Europe we had yet to see this item in person, and I was somewhat prejudiced against it as I thought it might be a bit gimmicky and flimsy. All my preconceived notions were shattered as soon as I tried it in my hands. This beautiful, slick little gem is sturdy, powerful and unbelievably quiet. The battery charges via a USB cable and lasts unbelievably long, we are talking up to a month for personal daily use. It has three pressure settings that change at the touch of a button, and are all powerful and consistent. The soft touch control button allows for great precision, making the application even easier than with the original AirPod airbrush. While remaining super easy to use for consumers, the Temptu Air marks the definitive transition of the Airpod product into the professional world, where it offers many practical advantages that we will illustrate in a full review coming soon. Oh, and did I mention how QUIET it is? The AirPod makeup formula has been improved for a while now, but it bears repeating. The new makeup is much more similar to the original SB formula. Gone is the strong floral smell that was so bothersome to many, the iper moveability and the remarkably shiny finish. The new Airpod product has all these aspects under control and the resulting makeup is simply spectacular, losing none of the advantages offered by the silicone formulation. It also flows much better out of the caps, making clogs and hiccups a thing of the past. Of course the Airpod system, based on pre filled capsules of color, had one last congenital flaw: the colors could not be mixed, inevitably restricting an artist's freedom to some degree. Enter the new Airpod Pro. This is essentially an Airpod capsule with a working opening at the top, allowing you to fill it with whatever color or color mix you can imagine, and then to use it with you Temptu Air device or with the traditional AirPod airbrush. The fact that the AirPod Pro has a 0.5 nozzle size means that practically any kind of airbrush makeup will be usable with this system, although I imagine you'll have to be careful with more fluid formulas like water based products. The AirPod Pro was just about to be launched at the Makeup Show, so we weren't actually able to see it and will review it as our US collaborator sends us one. Airpod Root & Hair is a silicone based line of colors for hair that can be also used for your eyebrows, as Jackie demonstrates so well in our video. The application is fast and the finish is soft and diffused enough to produce an amazingly natural effect. There are seven shades available covering any need, and the product is also available as a traditional Pro Sarter Set to be used with your AirPod Pro or with your traditional airbrush. 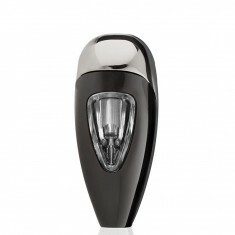 This is another product that we couldn't see yet as it was still to be launched, but it is certainly worth mentioning. The SB foundation line from Temptu has become an industry standard and the paragon for any silicone based airbrush product. The brand is now trying to up the ante with Hydra Lock, a new silicone based product that claims to have four times the hydrating power of Hyaluronic Acid. The line has a whopping 18 colors, but that's all we know, because while this product has just been released on the Temtpu website. All we can say is... we can't wait! Hi! I have the TemptuAir and love it for its ease of use and portability. I thought it was awesome to have a USB charge, which I can use in my car if I'm on my way to a job. Have you tried the Hydra Lock Foundation yet? I was using my other foundation in it but heard great things about the new formula. Thanks! Hi, apologies about the delayed Reply, for some reason Google didn't notify us about this comment. Yes I have tried and reviewed Hydralock, you'll find the review in our more recent posts. The Hydralock/Perfect Canvas formula is thinner than the classic SB and dries more quickly, making the application somewhat easier. It is definitely a matte formula with medium coverage. It has some excellent complements as well, such as the amazing Color Correctors and the eyeshadows. You will find a review for those as well. Thank you!